Service Provider of a wide range of services which include sheet metal components in ms and ss. 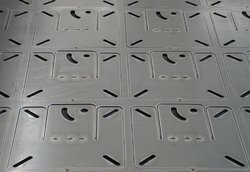 We Provides most superior quality range of Sheet Metal Components use in automobile, electronics, Plastic machinery, Textile machinery sectors, Electrical Parts, Switch Gear Parts, Automobile Industries, Agriculture equipments, . We are a prominent manufacturer and exporter of a wide range of such components For Automobile Parts and Precision Sheet Metal Parts.